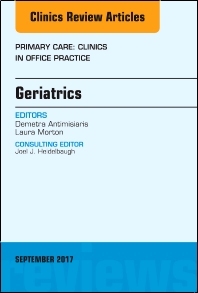 This issue of Primary Care: Clinics in Office Practice, guest edited by Demetra Antimisiaris, PharmD and Laura Morton, MD, CMD, is devoted to Geriatrics. Articles in this comprehensive issue include: Managing Polypharmacy in the 15 Minute Office Visit; Sexuality in the Older Adult; Dementia for the Primary Care Provider; Hormone Replacement: The Fountain of Youth? ; Depression in Older Adults; Advance Care Planning in the Outpatient Geriatric Medicine Setting; Pain in the Elderly: Identification, Evaluation and Management of the Older Adult with Pain Complaints and Pain-Related Symptoms; Delirium; The Older Adult With Diabetes And The Busy Clinician; Geriatric Assessment for the Primary Care Provider; Hypertension in the Older Adult; and Evaluation of the Older Driver.